Rag skirts are designed to be worn over regular skirts, pants or leggings. Very little sewing is required, so the project is ideal for anyone new to sewing, or for a fun, collaborative weekend project for a child to help you with. You can create different, custom looks by using different types of fabric for the "rag" parts of the skirt. Consider tulle, cotton, crinoline and other fabrics, as well as ribbon. 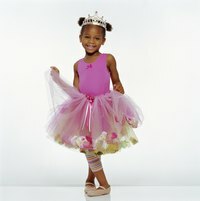 A tulle rag skirt has the look of a tutu and is suitable for a little girl. Measure the waist of the person who will wear the skirt. Add 2 inches to the measurement and cut a piece of elastic to this size. Machine or hand sew the ends together to create an elastic band. Measure from the waist down to the point at which you want the lower edge of the rag skirt to fall. This might be to the knee, just above the knee or all the way to the ankles, depending on the look you want. Cut your fabric and ribbon into strips of double the length you determined for the skirt. Include some shorter strips for an even more raggedy look, if you wish. The width of the strips is customizable, but keep them narrower than about 5 inches wide. The strips can be of equal or variable widths, and accuracy isn't important. Tie the fabric strips to the elastic band so that the knot is in the center of the strips. Let the lengths hang from both sides of the elastic. Slide the fabric strips tightly together as you work to make room for as many strips as possible. The more strips you add, the fuller the skirt will look. Tie lengths of ribbon in between the fabric strips where desired.